London’s journey to becoming a car-free city is moving up a gear. On Monday the new Ultra-Low Emission Zone will be introduced by Mayor Sadiq Khan who also wants more central London streets pedestrianised and a ban on car parkingspaces at new London homes and office blocks. Cycling mania has long gripped the capital but last year there was also a boom in the sale of electric scooters, skateboards and rollerblades, while the number of teenagers learning to drive continues to shrink. Major businesses have spotted this direction of travel. For example, the proposed new Tulip observation tower in the City has no provision for parking. This is not just about making a healthy choice but with high house prices and rents, plus new green tariffs, it is becoming too expensive to keep a car in the capital. Recent research from London estate agents Benham & Reeves reveals that a parking space will put an extra £400,000 on the price of a home in Westminster or Wandsworth. 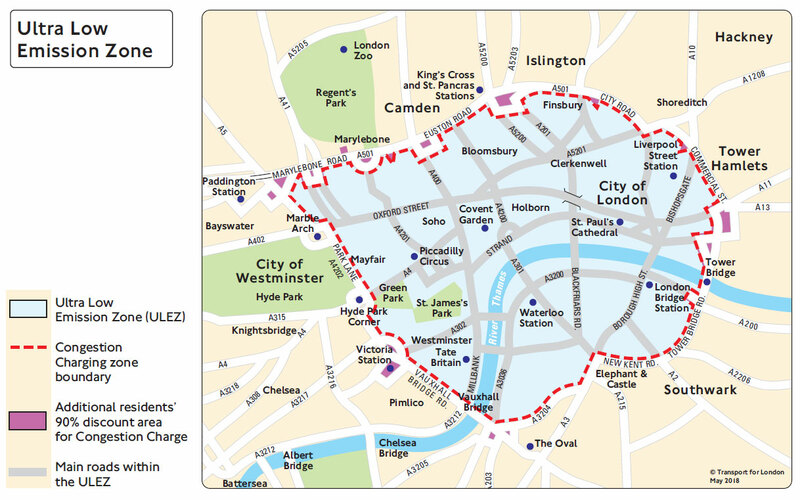 The new Ultra-Low Emission Zone covers the same area as the congestion charge — from Hyde Park across to Commercial Street in the east and Euston Road down to Elephant & Castle. People using diesel cars that are more than four years old, or petrol cars registered before 2005, will need to pay £12.50 extra a day to travel within the zone. For heavier vehicles, such as vans, that don’t meet tough new emission standards, the charge will be £100. The zone is set to be extended to the North and South Circulars by 2021. London’s new Ultra-Low Emission Zone: who is exempt? There is a no-charge grace period until 2021 that gives residents within the zone a chance to upgrade their car — if they can afford to do so. For those who live outside the zone but need to drive into it, the levy will apply — on top of the congestion charge — from next week. A £48 million scrappage scheme has been announced allowing micro businesses, charities and low-income households to apply for money to help them discard an old vehicle and buy a new emissions-compliant one. The financial help is subjective, however, and the Government decides whether the applicant faces “serious financial pressure”, while micro businesses must have fewer than 10 employees to qualify. This will penalise small construction companies with more than 10 workers who drive into central London to build more homes, explains London First’s David Leam. Silviya Barrett from the think tank Centre for London, warns: “It’s added another layer of complexity for people… it’s a very blunt instrument.” She backs a smart system that would calculate length of journey, time of day, income, benefits and type of vehicle. “Also, once you’re paying £12.50 a day it incentivises you to drive more,” she adds. The London Plan reads that “car-free developments should be the starting point for all proposals in places well-connected by public transport”. The parking provision for new homes schemes with good rail and Tube links has been cut from one space per home to none. What is more, in outer London the number of spaces has been reduced from two to one-and-a-half per unit. As a result, and to tap into the wellbeing culture, developers are now offering different incentives to entice home buyers. Dash is a new 71-home scheme in Hoxton with one- to three-bedroom flats. Prices range from £599,995 to £1.35 million, Help to Buy is available and there is a stamp duty holiday on the two-bedroom homes. There are no parking spaces as it’s a third of a mile walk to Old Street Tube. Homes come with a 12-month car club subscription. Call 020 3504 8310. Overlooking Battersea Park, The View, a 15-storey tower, gives each resident a cash card allowing for two years of black cab rides and London cycle hire scheme membership. Prices start from £775,000. Contact Savills on 020 7409 8756. The City of London has reported a fourfold increase in the number of cyclists, and borough councils are making cycling a major consideration in their regeneration schemes. Waltham Forest, one of three boroughs to apply for a £30 million Transport for London grant to create a “mini Holland”, now has a Leyton to Chingford cycle route, with town centre cycle lanes and upgraded junctions, low-traffic areas and new cycle hubs. Prices start from £295,000 for a studio flat at Motion in Leyton, by Peabody. Call 020 3906 1955. Barking Riverside is set to be London’s only NHS Healthy New Town. With over a mile of river frontage, it covers 443 acres and will deliver 11,000 new homes. Riddled with cycle tracks, its Biking Riverside cycle club offers free maintenance sessions. Hordes of commuters are expected to tread the pavements this Friday, International Walk to Work Day. Banker Sanjay Chopra will be one of them. He used to commute 12 hours a week from his home in West Byfleet, Surrey, but has now bought a studio flat at 10 Park Drive in Canary Wharf so he can stroll to the JP Morgan office. “I’ll now have those commuting hours spare to go to the gym or socialise,” he says. With nearly 350 homes, residents at 10 Park Drive will have access to a private sky terrace on the 13th floor. For more information, email Canary Wharf Group at residential.sales@canarywharf.com. Peabody is building a collection of one-, two- and three-bedroom apartments and duplexes for private sale and shared ownership just a short walk from the City at Wharf Road in Hoxton. Prices start from £630,000. Call 020 3320 8220. For owners of electric cars, Eastman Village in Harrow, by Barratt, has an abundance of charging points. The 55-acre former Kodak industrial site is being converted into 1,800 new homes, a school, shops and a new medical centre. Prices start from £330,000 for a one-bedroom flat, with Help to Buy available.